Our climate is a complex phenomenon. In the atmosphere, there is about 0,04% carbon dioxide. The discussions about the climate, though, could be up to 100% about carbon dioxide. Thinking it over once more, you’ll find that this tiny amount of carbon dioxide, CO2, is easier to double than the 21% oxygen in the Earth’s atmosphere. Burning fossil fuels emits CO2 into the atmosphere; photosynthesis needs CO2, but it is not that simple. Thinking fast doesn’t always generate good ideas when it comes to complex systems. However – let’s look at the Earth’s vegetation. Turning forests into cropland and pasture for cattle was for centuries a signature for the agricultural human. A larger population needs more food. Growing cities need more land. Forests have become valuable both to the economy and to the climate. Sensitive rainforest and mangrove areas are especially valuable to our climate. In other words; forest areas are worth observing, and that’s most effectively done by satellite. Satellites don’t have to be huge and heavy. Proba-V is a miniaturized satellite with a mass of 140 kg. (The ALOS satellite described further down had a mass of 4000kg at lift-off). “V” in the name “Proba-V” stands for Vegetation. Its mission is to provide a new global map of land cover and vegetation growth every second day. The onboard imager collects light in blue, red, near infrared and mid-infrared wavelengths, a suitable mixture for monitoring plants, forest growth, and inland water bodies. The signals, ElectroMagneticRadiation (EMR), emitted or reflected from a certain spot on the Earth’s surface is not the same in the morning as in the afternoon. That issue is solved by placing the Proba-V in a sun-synchronous orbit. 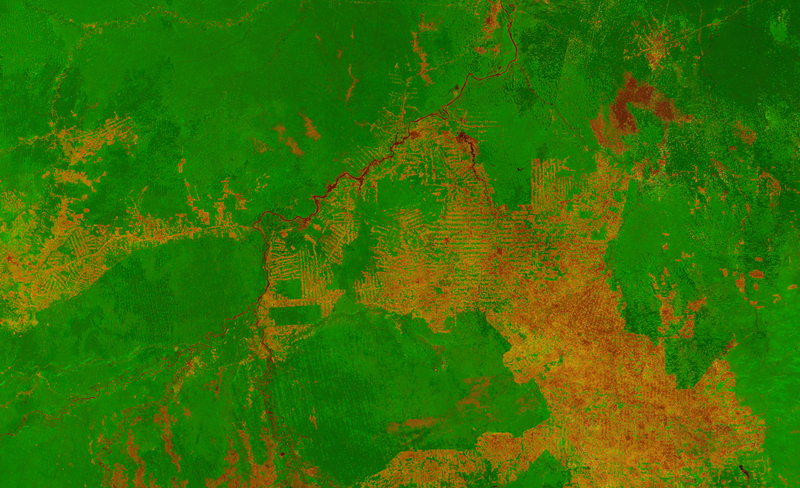 In the 300 m-resolution image above, the brownish colors indicate deforested areas. You see a distinct fish-bone pattern showing new cutting areas. The green area in the lower center of the image is the national park of Pacaás Novos. On the northwest side of the river, you see another green area – Mapinguari national park. This land, although partly deforested, shows a serious will to keep forests in certain areas healthy and use other quite compact areas for living and farming. Knowing that there are new images taken from this area every two days may make you think twice before cutting down trees in the protected “green areas”. The image below shows rich vegetation in bright red. 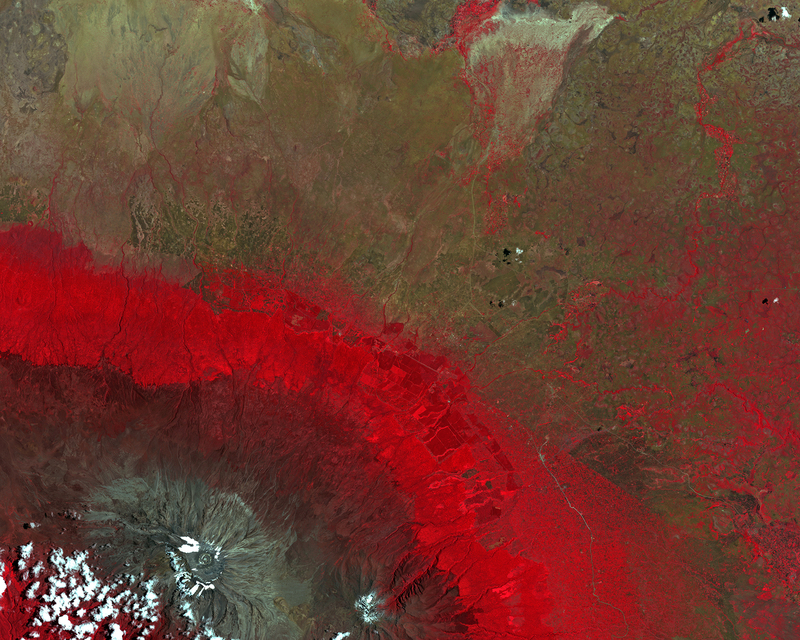 You see rich vegetation down the slopes of Kilimanjaro, lower left, and along the rivers to the right in the image. A false-color image like this allows easier discrimination between different types of vegetation. Mapping and classifying land use, crop type, and crop health is truly helped out by these types of images. 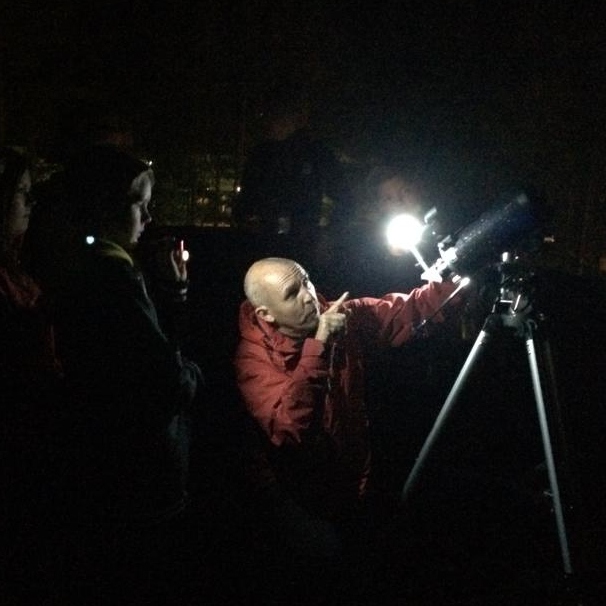 We also have to remember that there are more possibilities available when it comes to constructing the “eyes” of a satellite. The human eye detects EMR in a wavelength range roughly between 400 and 700nm, from violet to red. When you look at an image built up of signals including infrared wavelengths there are no colors left in the palette. After thinking it over, it is quite natural to use colors in a way that makes the main information clearly visible. In the best scientific world, there’s little arguing. The results are open to the commons and understood by anyone. Whether we are approaching that stage or not will be obvious in the future. Anyway, a lot of information is available to anyone or anyone registered. “Global Forest Watch” (Beta) is an example of public websites with interactive options. Please notice the line “Tree cover loss is not always deforestation” in the box. NASA‘s site World of Change contains a set of images in pairs. One image showing a region as it looks now and the other one showing the same region months or decades earlier.